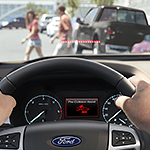 With the legacy of being one of the first car manufacturers in the world and a long history of innovation and design, Ford turns its skills towards a suite of driver assist technology upgrades that make the necessities of driving more enjoyable. Ford Co-Pilot360 eliminates repetitive tasks like raising and lowering high beams or continually adjusting highway speed by automatically performing them exactly when needed. It can also keep your car centered in its lane and warn you if it begins to weave or drift. Safety features receive the most attention, with necessary functions like automatic braking after a collision if the driver is unable to do so. Sensors and cameras on the vehicle will monitor surrounding traffic and provide a proximity warning. A rear-facing camera gives the driver greater spatial awareness in tight situations, and the same technology monitors blind spots while the vehicle is driving at higher speeds.